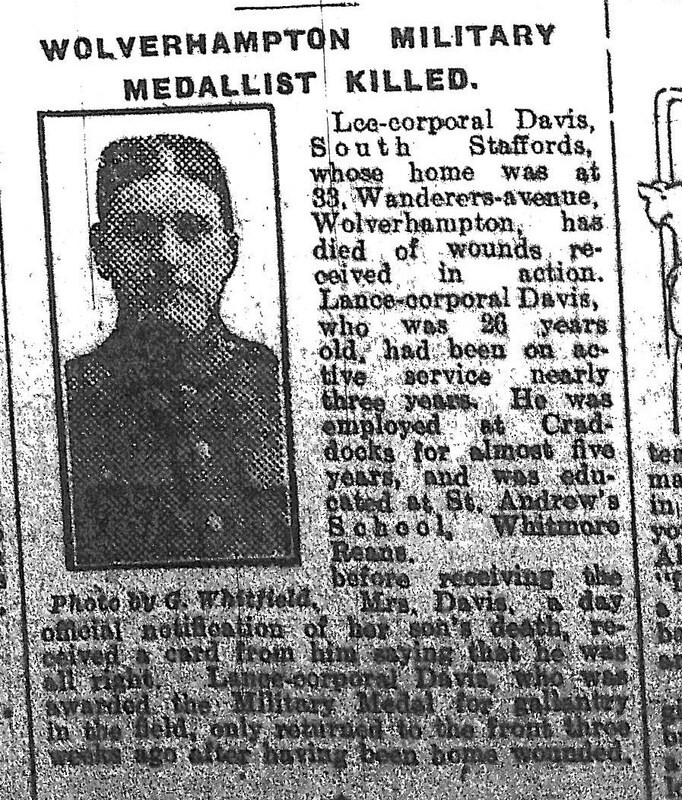 Lance-Corporal Cecil Harry Davis was born in Wolverhampton on 1 November 1890, to parents William and Diana Davis of 4 Evans Street. He was educated at St. Andrew’s School in Whitmore Reans. His school admission register states that he was admitted to the Junior School on 3 October 1898, and left on 30 October 1904 to go to work. By the 1911 census he was out of work but in the boot trade, and later went on to work at Craddocks shoes for nearly five years. He went out of a trench and carried in a wounded despatch bearer and delivered the despatch. Subsequently he saw an officer about 10 yards out in the open, and carried him into safety. After being wounded, he left the front, before returning to service. He was killed in action on 13 October 1917 on the Western Front, and is buried at Dozinghem Military Cemetery in Poperinge, Belgium. He is listed on the war memorial in the chapel in St Peter’s Church. News of his death appeared both in the Express & Star, above, and in the Midland Counties Express on 10 November 1917. His address when he died was 33 Wanderers Avenue. 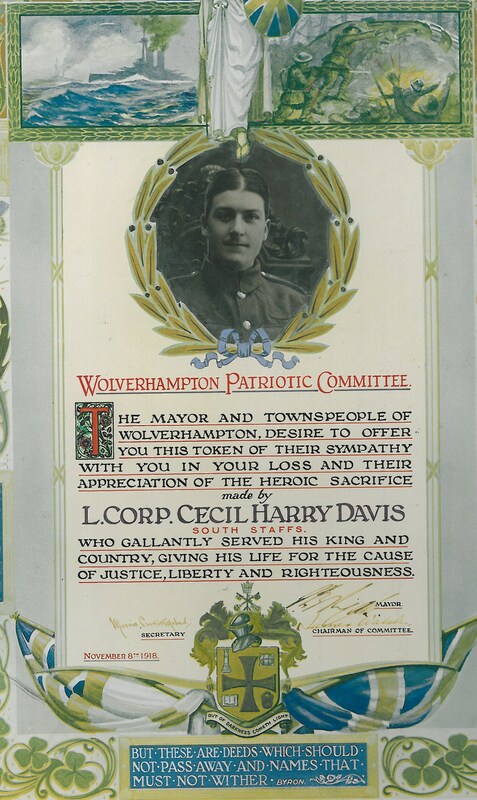 After Davis’s death, the Wolverhampton Patriotic Committee presented this poster to his family, in honour of his contribution to the cause “of justice, liberty and righteousness”. He was also mentioned alongside a photograph in the Express and Star.The research for this blog post has been conducted by one of our volunteers, Elizabeth Stenning. All Saints School opened in 1865 with boys and girls aged between two and twelve in a converted barn on Steelhouse Lane, later moving to a site next to All Saints’ Church. By the date of this log book, the school had split into separate boys and girls schools in 1881, and was to remain so until 1934. All Saints School later merged with the Grove School in July 2002. There are also further occasional closures of the schools “so that the teachers may be spared to the town hall to write and check the ration cards.” Little or no other references are made to the war, and generally school life appears to carry on as before. This is the second of volunteer, Frank Lockley’s reports on the soldiers buried at Heath Town Cemetery. Buried 12th October 1915, age 27. Grave ref. new ground 32/29. 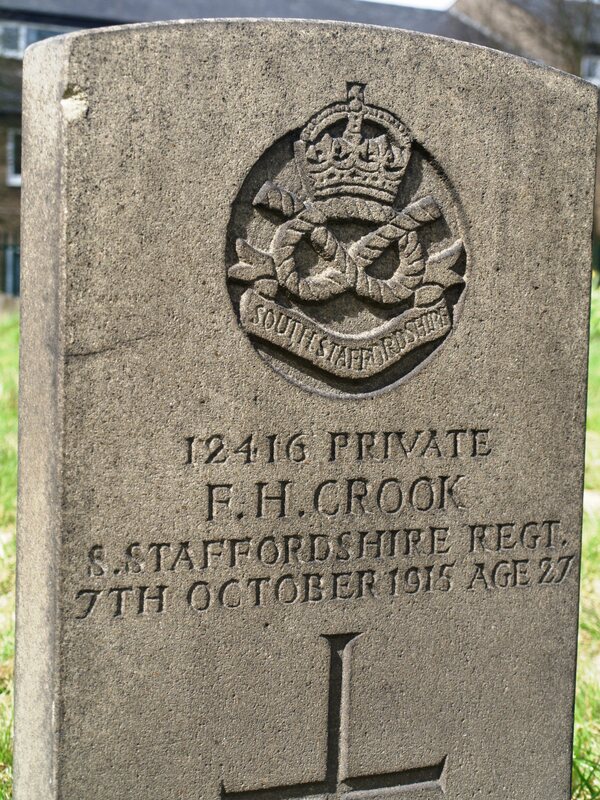 Frederick Crook was born in Heath Town on 23 July 1888, son of Fred and Adelaide. His father died in 1892 and his mother remarried the following year. In 1903 Frederick began a 6¼ year apprenticeship with the Great Western Railway at Wolverhampton, gaining his certificate on 23rd August 1909. In September 1910 he starts work as a fitter at Leamington Station, but this is short lived as he is dismissed after just one month. At the time of the 1911 census he is back with his mother and step father in Stafford Road Wolverhampton and working as a fitter in a motor works. Frederick enlisted with the South Staffs regiment just two weeks after the outbreak of war possibly initially with the 3rd Reserve Battalion. His Medal Index Card shows that he entered France in February 1915. He was wounded at the battle of Festubert in the Arbois region of France. This action took place over 10 days in May 1915, an attack by the British First Army to capture the village of Festubert. The action was successful, but only gained around 1km of ground with more than 16,000 casualties. Frederick was one of those wounded and died from his wounds in the Red Cross house in Sunderland on 7th October 1915, age 27. In the Midland Counties Express of 18th November 1916, a piece about Frederick appeared under the heading “A STAFFORD WORKS EMPLOYEE” (although the newspaper printed his surname as “Cook”). His parents were stated to be living at 3 Dunstall Street, Wolverhampton. An article also appeared about his funeral in the Express & Star on 13 October 1915. 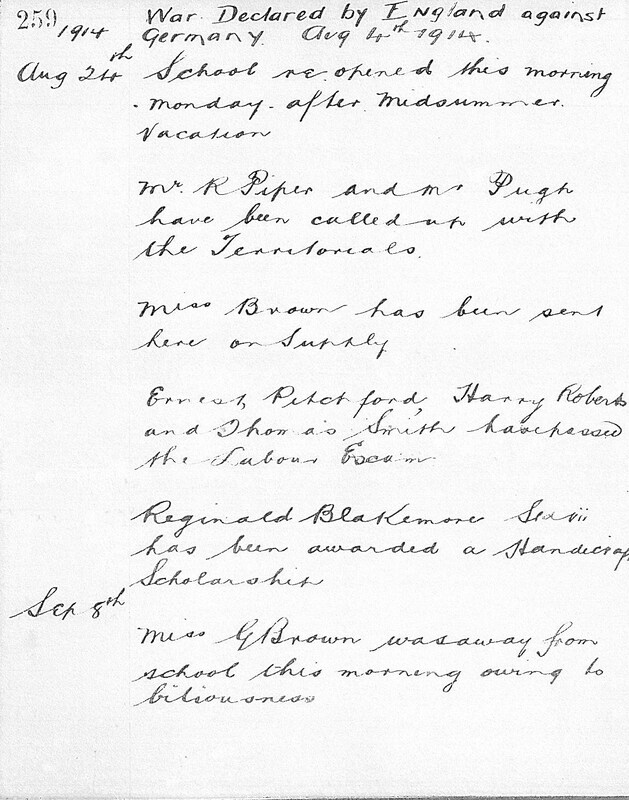 Back in November 2012, we detailed life in the Cottage Homes School during the First World War, as demonstrated by the entries in the school log book. 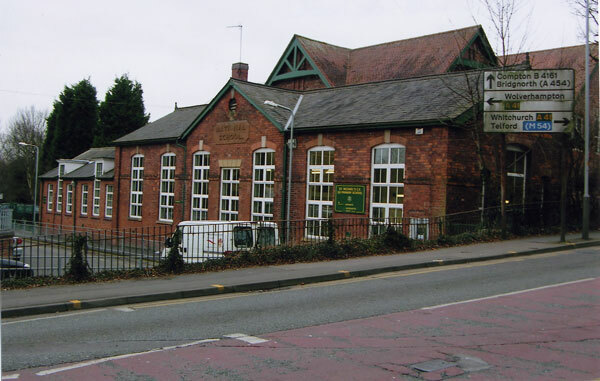 Today, we will look at the log books of St Michael’s CE (Controlled) Primary School on Lower Street, Tettenhall. This school, formerly known as Tettenhall National School, is believed to have been established about 1868. In 1943 the girls junior department merged with the boys to form a mixed junior department. Until 1966 the school was administered by Staffordshire Education Committee. War was declared on Aug 4th thus England became involved in Great European War. In consequence of this it is proposed to make changes in the schedule of work, in order that the work may be progressive, & that the national crisis through which we are now passing, may leave a lasting impression upon the heads & minds of the children. Yesterday evening a great air raid occurred over the midland counties, doing considerable damage to the Black Country towns. It is estimated that either 6 or 7 Zeppelins took part & that they passed over very close to Tettenhall. Thanks to Charlotte Cray, one of our volunteers, who transcribed this log book for us.